On the planet Tython, the ancient Je daii order was founded. And at the feet of its wise Masters, Lanoree Brock learned the mysteries and methods of the Force and found her calling as one of its most powerful disciples. But as strongly as the Force flowed within Lanoree and her parents, it remained absent in her brother, who grew to despise and shun the Je daii, and whose training in its ancient ways ended in tragedy. Now, from her solitary life as a Ranger keeping order across the galaxy, Lanoree has been summoned by the Je daii Council on a matter of utmost urgency. The leader of a fanatical cult, obsessed with traveling beyond the reaches of known space, is bent on opening a cosmic gateway using dreaded dark matter as the key risking a cataclysmic reaction that will consume the entire star system. But more shocking to Lanoree than even the prospect of total galactic annihilation, is the decision of her Je daii Masters to task her with the mission of preventing it. Until a staggering revelation makes clear why she was chosen: The brilliant, dangerous madman she must track down and stop at any cost is the brother whose death she has long grieved and whose life she must now fear. Includes a special, full-color excerpt from the Dark Horse comic "Star Wars: Dawn of the Jedi "and an original Dawn of the Jedi short story by John Ostrander! 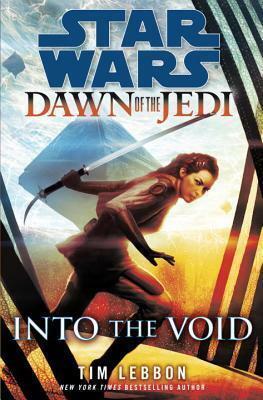 Praise for "Into the Void"
A good solid "Star Wars" adventure story with heart. Knights Archive"
Tim Lebbon is a "New York Times" bestselling writer whose recent books include The Secret Journeys of Jack London series (co-authored with Christopher Golden), "Echo City, The Island, "and" Bar None." He has won four British Fantasy Awards, a Bram Stoker Award, and a Scribe Award, and has been a finalist for International Horror Guild, Shirley Jackson, and World Fantasy awards.